Like I said in This Post, if you’ve got more than a few holiday events coming up then you should invest in Separates . If you go with Blacks ( like ive done here because it ALWAYS works), Jewel Tones and Metallics you can mix and match all day long. Just add different Accessories and Voila! you’ve got new looks. If your Subscribed (subscribe Here) to me on YouTube you have probably seen this look because it was featured in my Holiday Fashion Lookbook. 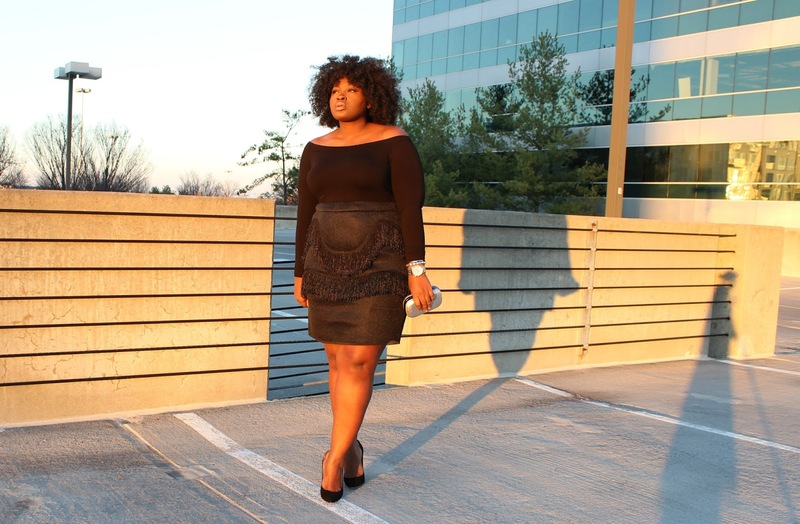 A lot of you inquired about the Fringe Skirt, so I figured the look was a winner for the blog. As I stated above I am a die hard separates fan, even when its not the holidays because you get the most bank (from your wardrobe) for your buck . 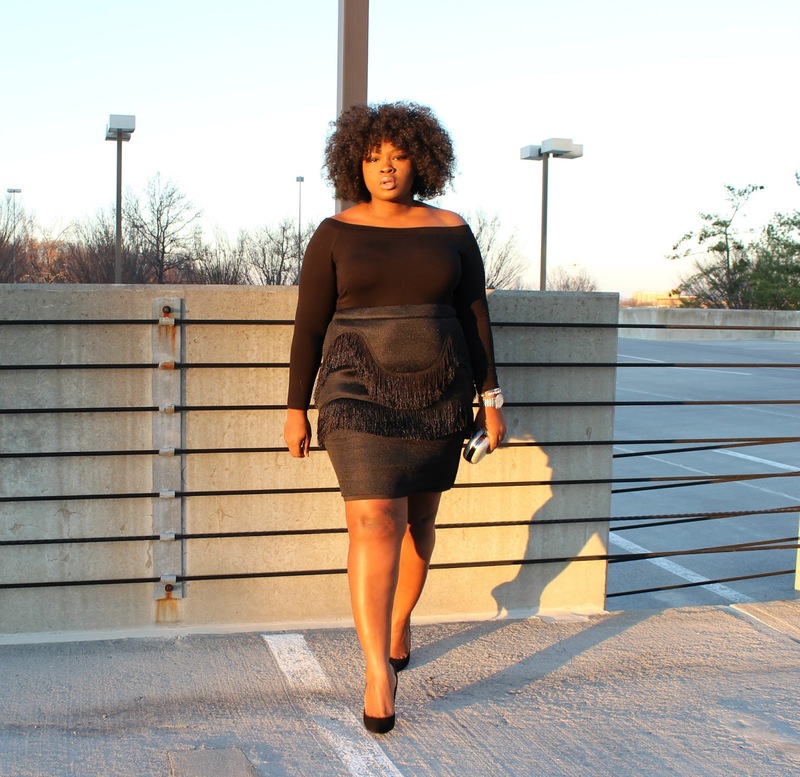 For this look I pared an off shoulder Romper from Asos ( yes I said romper) with a Fringe Skirt from Eloquii which I stalked for like a year and a half ( sadly I got the Fringe Skirt on super sale and its SOLD OUT similar Here (now at 25% off use Code: GIFT25) & shop more Fringe Here). I decided to go with Silver Accessories and I finished off the look with my trusty Black Pumps. This look would be perfect for a conservative Holiday Party like a company/office related event; for more holiday looks see This Post. This was my very first Eloquii purchase and I wasn’t disappointed . This skirt was true to women’s sizing & in my opinion the skirt was made very well(fabric zippers and all). Also I had no issues with shipping which is always a concern when ordering online. Be sure to come back Saturday for advice on maximizing your wardrobe I will be sharing tips on channeling (a how to) holiday glam with accessories . Right now MACYS is having their Friends & Family sale and you can save an extra 25% off use code :FRIEND (to save even more on your own Fringe Skirt ) + you can earn 8% cash back NOW if you sign up for Ebates Here.